Director/Screenplay – Tony Elliott, Producers – John Finemore, Kyle Franke & Mason Novick, Photography – Daniel Grant, Music – Keegan Jessamy & Bryce Mitchell, Visual Effects Supervisor – Kevin Chandoo, Visual Effects – Technicolor Toronto, Special Effects Supervisor – Derek Liscoumb, Production Design – Oleg Savytski. Production Company – Lost City Productions/XYZ Films/MXN Entertainment. Renton, a former inventor for the Torus Corporation, wakes up at 6:16 am alongside Hannah, the former girlfriend who returned to him the night before. Just then, armed men burst in to demand scripts (money chips). Renton attempts to stop them but is killed. He then wakes up and it is 6:16 am again as the scenario plays itself out all over again. He realises that he is caught in a timeloop created by the ARQ (Arcing Recursive Quine) perpetual motion machine he has created, which repeats the same events every three hours and fourteen minutes. As Renton tries to alter events throughout the course of different versions of the scenario, he begins to discover that everything that is happening is not quite as it appears to be. ARQ was a directorial debut for Canadian Tony Elliott. Elliott had previously worked as a story editor on Orphan Black (2013-7) – indeed claims that his at that point unproduced script for ARQ is what obtained him the job – and subsequently Hunters (2016– ), as well as a producer on 12 Monkeys (2015-8). ARQ premiered at the Toronto International Film Festival and appeared soon after on Netflix. The timeloop film in which the protagonist finds themselves repeating (usually) the same day over and over again with minute variations first appeared in the comedy Groundhog Day (1993), which has become a classic. The basic idea has been repeated in a number of other films with the likes of 12:01 (1993), Retroactive (1997), Repeaters (2010), Source Code (2011), Edge of Tomorrow (2014), Before I Fall (2017), Happy Death Day (2017) and Naked (2017), even an entire tv series Day Break (2006). Tony Elliott does a fairly good variant on what is starting to become an overused theme. 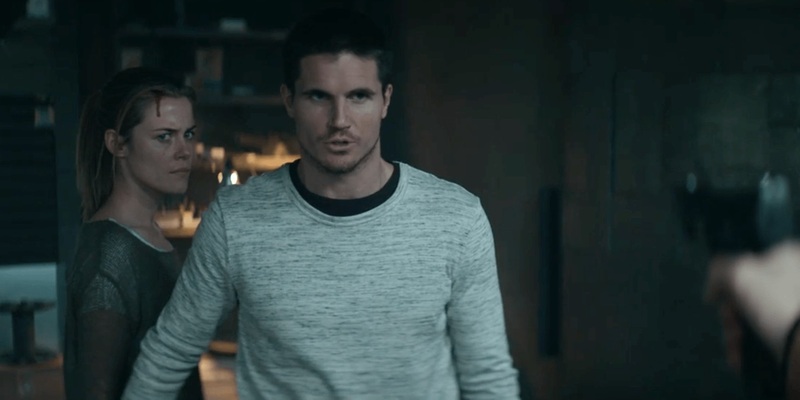 For one, he economically contains the entire film to a single setting – Robbie Amell’s laboratory home (a warehouse location in Toronto) and only once goes outside of three rooms. Moreover, the cast is limited to two mildly known tv actors and a handful of heavies. Elliott has fun sketching out the basic scenario and then endlessly repeating it (as all the other timeloop films do). Unlike the other films, Elliott uses each repetition to provide a series of twists and turns as Robbie Amell starts to gain new information about the people around him and what is happening that aids him in the next go around. Although, unlike the others, this film reaches an unresolved ending. In between this, Elliott constantly dangles hints of an interesting future – one where apples are nearly extinct, there are no birds, people need to wear air filter masks, Australia is a radioactive wasteland and corporations dominate the world.